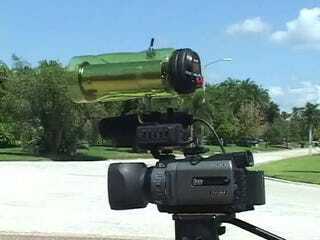 The thing you see on the top of the camcorder was once a $25 Hot Wheels toy radar gun: Not any more, it ain't. Using a plastic drink bottle and an Altoids tin, among other things, it's been turned into a full-on radar gun. "Even cops don't have one of these," says KipKay, the brains behind this, excitedly. How-to video is after the jump.